Whether you’re looking for a garden shed to store your tools, or a workshop to have space to work on a project or business, sheds are the most useful home addition. Whatever the size, a shed will give your property extra space and added value, and help to keep your home and garden tidy, with your tools, bikes, furniture – or whatever you want – stored away and out of sight. If you’re looking for a job well done by professionals who install sheds in Kent and who know what it takes to deliver good service, look no further than Kent Sectional Buildings. Experienced builders of sheds throughout the county, and determined to do the best job for you, the team at Kent Sectional Buildings’ has a great reputation and knows exactly how to deliver a perfect finished product. Whether you know exactly what you want your purpose-built shed to look like, or you’ve only got as far as Googling “sheds kent” and just need some advice, our family-run business can help. We know it can be a daunting task, and that’s why our dedicated and friendly team offers a bespoke service from the first stage. We can talk you through options, build to your specifications and do everything from deliver the finished product to erect and glaze it. 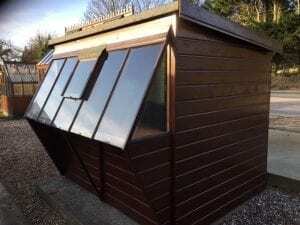 We also offer conservatories, greenhouses and potting sheds – and can even help with planning permission, though rest assured this isn’t required for most sheds. Everyone wants to de-clutter, but it’s hard when you don’t have space in the home. Leaving tools and machinery outside puts them at risk of theft or rust damage, costing you thousands. So make the clever decision to buy a sturdy, smart and great-value shed instead – you won’t look back. Your home will be neater, your belongings will be more secure and your clutter will be gone! If you are looking for a Garden shed that perfectly matches your requirements then we will make one specially for you. This a perfect building for a workshop in the garden. A very sturdy construction with locking door. A lovely little building for the amateur gardener to bring on seedlings for the garden.